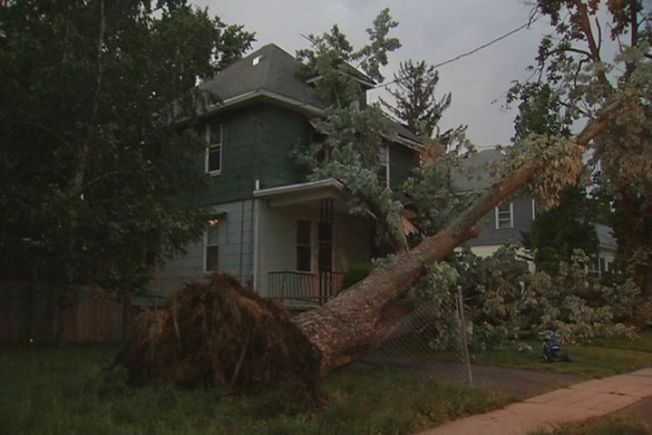 Whether it was hit by lightning or uprooted by the wind, the silver maple that smashed onto the front yard of 24 Whiting Road in East Hartford Tuesday evening could have done a lot more damage - it scratched two children but did not seriously hurt them, according to neighbors. Jesse Rodriguez, who lives next door, saw the tree fall. "I was looking at the tree swerving, I saw this tree here falling over," he said. "I know there was people here so I came running, I know their kids." Somehow the two children escaped serious injury. Their toys are buried in branches and leaves. Their landlord and neighbors say they went to the hospital with bumps and scratches, along with their family, as a precaution.